LG Electronics (LG) on Tuesday unveiled the LG V40 ThinQ in Singapore. The latest iteration of the acclaimed V series, the LG V40ThinQ is a multimedia powerhouse device designed for today’s generation of storytellers who communicate with audio and visuals. The LG V40 ThinQ retains the V series design philosophy with an improved 6.4-inch FullVision OLED display and even slimmer bezels than before. Powered by the Qualcomm ® Snapdragon™ 845 Mobile Platform paired with 6GB of RAM and 128GB of internal storage, the LG V40 ThinQ delivers powerful features that have made the LG V series a favourite among smartphone users. LG has been featuring high-fidelity audio in its smartphones and the V40 ThinQ is no exception, being the first LG phone to carry the Audio Tuned by Meridian label. The 32-bit Hi-Fi Quad DAC produces a balanced sound signature that comes extremely close to the quality of an original recording. And Boombox Speaker, originally introduced on the LG G7+ ThinQ, doubles the bass of conventional smartphone speakers by utilizing the internal space of the device as a resonance chamber. When placed on a solid surface or hollow box, the LG V40 ThinQ acts like a woofer to amplify the bass even more. The LG V40 ThinQ supports 5 Bluetooth A2DP audio codecs namely; aptX HD, LDAC, AAC, aptX, and SBC. The clean lines and sophisticated colours emphasise the main design elements of the LG V40 ThinQ: smooth touch, unique color and seamless form. Its proprietary Silky Blast™ process etches the tempered glass back with microscopic pits to create a smoother matte finish which feels extremely comfortable in the hand. The matte glass also offers high resistance to fingerprints and stains. The LG V40 ThinQ retains the slim and light design heritage of the V series, weighing only 169g and measuring a svelte 7.7mm in thickness. Like its predecessor, the LG V40 ThinQ is IP68 rated. 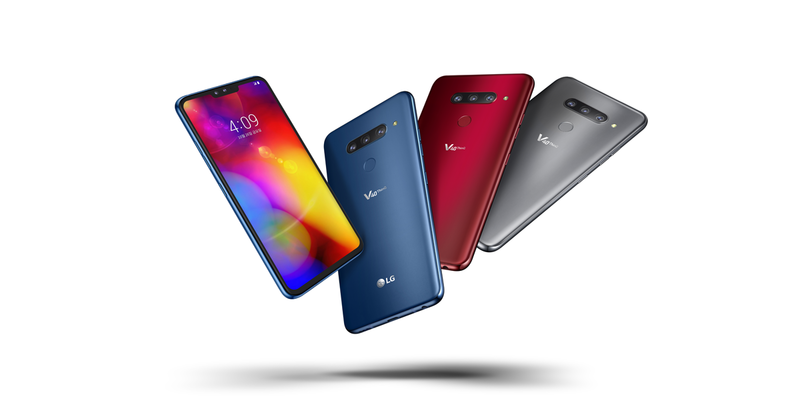 The LG V40 ThinQ will be available in Singapore from January 26, 2019, in Platinum Gray, Moroccan Blue, and Carmine Red colours. Retailing at S$1,098, the V40 ThinQ will be available for purchase at M1, Singtel, and StarHub. Purchase the smartphone from 26 January to 22 February 2019, and receive a complimentary LG W7 Watch in Silver (model LMW315) worth S$598.